We had been searching for a entertainment center for our great room at the lake house. I found the perfect one, except for the $$$$. It had white framing with the top, drawer, cabinet fronts, and legs in different stains of wood, with mismatched hardware. I scoured the Internet to find a deal or a substitute, but it wasn't comparable in structure or materials even though I met one goal of lowering the price. 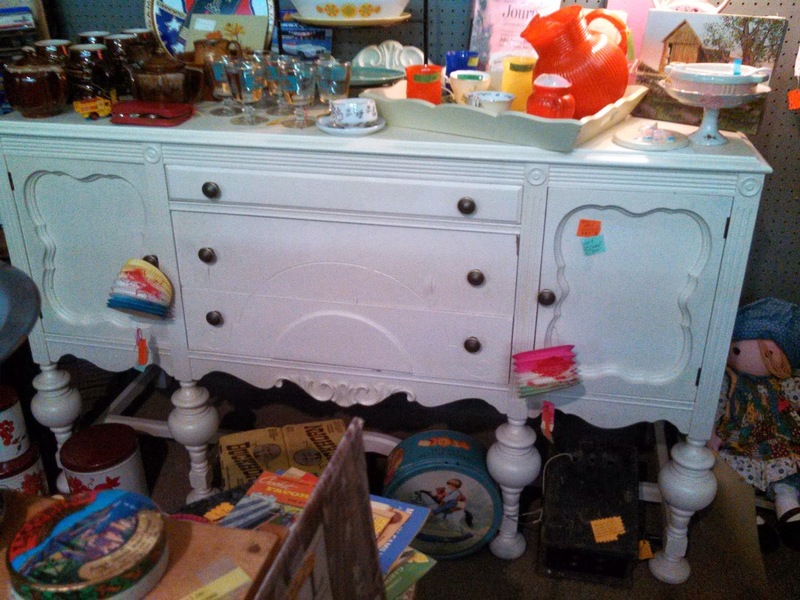 At a local antique store I scored this marked down buffet. It was the answer to my entertainment center quest within my budget. 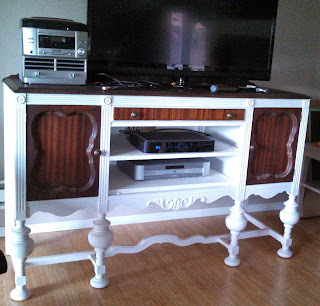 It had a few blemishes but seeing past the issues was my vision of our entertainment center. After checking my supplies, I made a list of items I didn't have in my stash from other projects. I drove to our nearby Lowe's, which is a good resource for gaining knowledge, and bought my supplies. I began the process of removing the knobs and hinges, taking care to mark them because the wrong one may not fit properly. Next I sanded the top, doors, and center drawer front until all the paint was removed, and then the remainder of the buffet enough to rough up the surface to paint . We measured the opening for each shelf. My husband cut two shelves from oak plywood with his table saw, then drilled a hole through the back of the buffet between the two shelves for the cords. I used my new iron for the first time to iron on the oak facing to the shelves. Then I used Ebony stain(top), walnut stain(doors)and drawer front. Tape off the edges to insure clean lines to paint the frame, shelves, interior and legs with Linen paint. compliment the white painted trim in our home. I look forward to your comments, please share your ideas too. great job it looks stunning it's an amazing piece to begin with and love how you have transformed it thanks so much for sharing at "Meet the Neighbors"
You rocked this for sure. Its' a gorgeous piece especially the legs. I have to remember to find an antique store in our area to find some treasures like this. Found you on our linky party Meet The Neighbors.